With his signature detailed drawings, David Macaulay uses his personal story of immigrating to the US in 1957 to explore the history and design of engines and ships. He plays with scale - a huge hand on the page moves parts of a machine to show how it works - to explain complexities. The amusing details - a rabbit startled by a moving piston, a face peeking out a porthole, and a half eaten cookie on a drafting table - draw the reader into the story behind the science. There is more to discover with each reading! 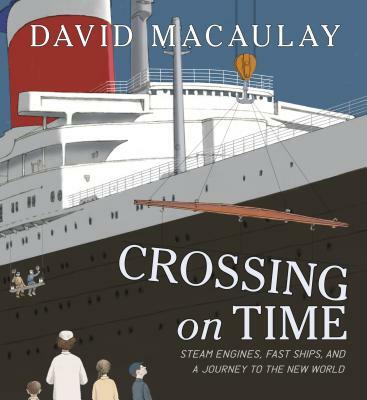 David Macaulay, co-creator of the international bestseller The Way Things Work, brings his signature curiosity and detailing to the story of the steamship in this meticulously researched and stunningly illustrated book. Prior to the 1800s, ships crossing the Atlantic Ocean relied on the wind in their sails to make their journeys. But invention of steam power ushered in a new era of transportation that would change ocean travel forever: the steamship. Award-winning author-illustrator David Macaulay guides readers through the fascinating history that culminated in the building of the most advanced—and last—of these steamships: the SS United States. This book artfully explores the design and construction of the ship and the life of its designer and engineer, William Francis Gibbs. Framed around the author's own experience steaming across the Atlantic on the very same SS United States, Crossing on Time is a tour de force of the art of explanation and a touching and surprising childhood story. Born on December 2, 1946, David Macaulay was ten when his family moved from England to the United States. An early fascination with simple technology and a love of model making and drawing ultimately led him to study architecture at the Rhode Island School of Design. He received his degree in 1969 after spending his fifth year with RISD’s European Honors Program in Rome. The next four years were spent working in interior design, teaching junior and senior high school art and tinkering with the idea of making books. The tinkering paid off. His numerous awards include the MacArthur Fellowship, the Caldecott Medal, won for his book Black and White, the Boston Globe–Horn Book Award, the Christopher Award, an American Institute of Architects Medal, the Washington Children’s Book Guild Nonfiction Award, the Deutscher Jugendliteraturpreis, the Dutch Silver Slate Pencil Award, and the Bradford Washburn Award, presented by the Museum of Science in Boston to an outstanding contributor to science. He was U.S.nominee for the biennial, international Hans Christian Andersen Award in both 1984 and 2002. Macaulay currently lives with his family in Vermont.